A unique and well-preserved mosaic depicting the battle of David and Goliath has been looted in Syria. I was first shown a higher-res version of this image several months ago, but was not allowed to share it. It’s now posted on a French website, and you can read a (poor) Google translation with this link. At this point, there do not appear to be any other stories on the discovery, but perhaps that will change. An official in the Directorate General of Antiquities and Museums in Syria believes that the mosaic comes from a church in northern Syria and dates to about AD 600. This may be the only known depiction of David and Goliath on a mosaic floor. The image depicts the warrior Goliath standing on the right side with full battle armor. To the left stands David with Goliath’s head on the end of his spear with the headless Goliath now laying at his feet. In the upper right corner, Saul and two others (brothers?) 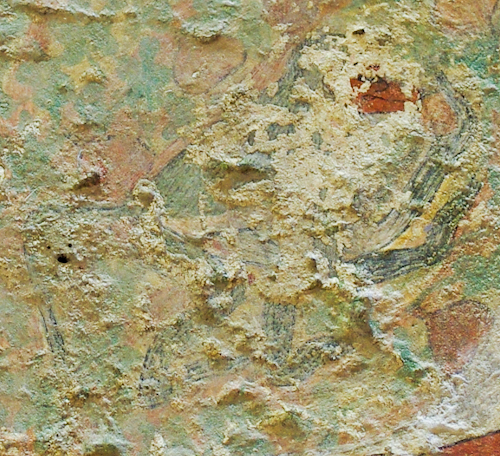 are depicted within the walls of a fortress. In the upper left corner are three women, probably those who rejoiced in David’s victory. A Google search for this image reveals that it was posted on several Arabic websites on July 21-22, 2014. The Met has an image of a silver plate depicting the battle, dating to approximately the same time (AD 630). A Roman gate discovered during excavations by the University of Haifa in the ancient city of Hippos, located at Sussita National Park, may cast light on the mystical bronze mask of Pan, considered by archeologists to be the only object of its kind in the world. Researchers from the university’s Zinman Institute of Archaeology announced on Monday that they believe the gate may have led to the compound of Pan, the god of shepherds, after unearthing it during last year’s excavation season…. The researchers concluded that the original gateway was over 6m. high, while the building (propylaeum) itself was even taller,” the archeologist said. The full story, including photos, is here. A 3D model of the gate is here. The Temple Mount Sifting Project has released a new video showing dozens of their discoveries. Another video released this month features David Hendin explaining the coins of the Jewish War. Egyptian officials are re-opening the tombs of Queen Nefertari and King Seti I in Luxor, but the cost for a ticket will be steep (about $113). Researchers suggest that King Tut's dagger was made from a meteorite. The BBC has the latest “the Dead Sea is dying” story, including an impressive photo of Mineral Beach. The ASOR Archive Photo of the Month shows archaeologists and local workers at Qumran in 1952. In terms of visitors, the Louvre is the most popular museum in the world. The British Museum is #5 and the Vatican Museums are #7. The lavish lifestyle of the Roman Empire elite is on exhibit at the Nelson-Atkins Museum in Kansas City. The Getty Museum has acquired a valuable Greek funeral vase and a Roman marble head. A new exhibit at the Met in New York City focuses on Jerusalem between the years 1000 and 1400. Ashkelon: A Retrospective: 30 Years of the Leon Levy Expedition is a new exhibit running at the Rockefeller Museum in Jerusalem until the end of the year. Haaretz ran a profile of Geza Vermes on the anniversary of his birthday. The Israel Antiquities Authority raided a shop in the Mamilla Mall on suspicions of selling looted antiquities. “For the first time in history the texts and images of all the Dead Sea Scrolls are available in their totality on the Internet.” From Brill for a purchase price of $5,940. An in-depth article by the Atlantic Monthly has uncovered the original source for the fake Jesus wife papyrus. The Harvard professor who published the artifact now believes that it is probably a modern forgery. With the help of Google Earth and drones, researchers have discovered a massive ceremonial platform in Petra. The Jerusalem Post has an update on the on-going renovations at Bethlehem’s Church of the Nativity. One of the discoveries is a mosaic of an angel. A $1.3 million gift has launched the restoration of the Edicule in the Church of the Holy Sepulcher. People are speculating on what they will find. Israeli authorities have ordered the Jordanian Waqf to halt construction of toilets just outside the Temple Mount. A collection of 16 coins from the Hasmonean period were discovered in excavations in Modiin. A Greek archaeologist thinks he may have found the tomb of Aristotle. Others disagree. 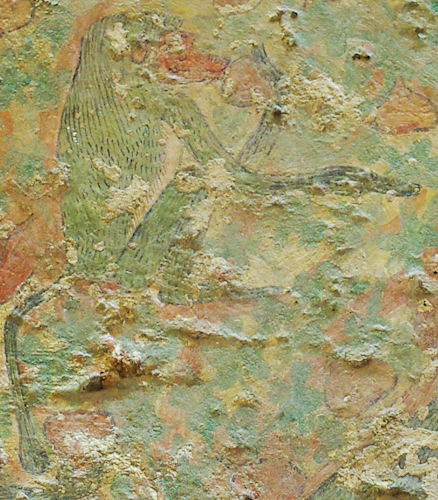 Canaanites living in Gath in the Early Bronze Age were sacrificing animals imported from Egypt. The journal article is available here. The Giza pyramid is not square. The ancients were off by about 5 inches (14 cm). The Guardian has posted a dozen photos of excavations in Egypt in the 1910s, including several of John Garstang. The Bible and Interpretation has posted an important new article: Addressing Survey Methodology in the Southern Levant, by Aaron Tavger, Joe Uziel, Dvir Raviv, and Itzhaq Shai. 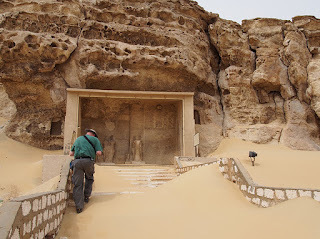 Scott Stripling is on The Book and the Spade this week talking about the latest from his excavations at Khirbet el-Maqatir. Wayne Stiles traces the geography of God’s dwelling place on earth. You don’t see this for sale very often: Survey of Western Palestine, 1881 – 1888, 9 vols and 78 maps/plates (set) & The Survey of Eastern Palestine 1889. $10k. A commenter to our post about Egypt yesterday requested assistance in locating the monkeys in the fig tree. The monkeys are green with brown bottoms and faces, making it hard to pick them out among the green foliage and brown fruit and branches. 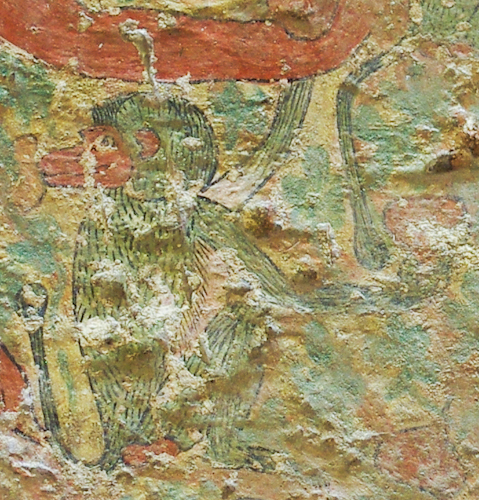 The monkeys form a triangle, one in the lower left, one in top center, and one in the lower right. 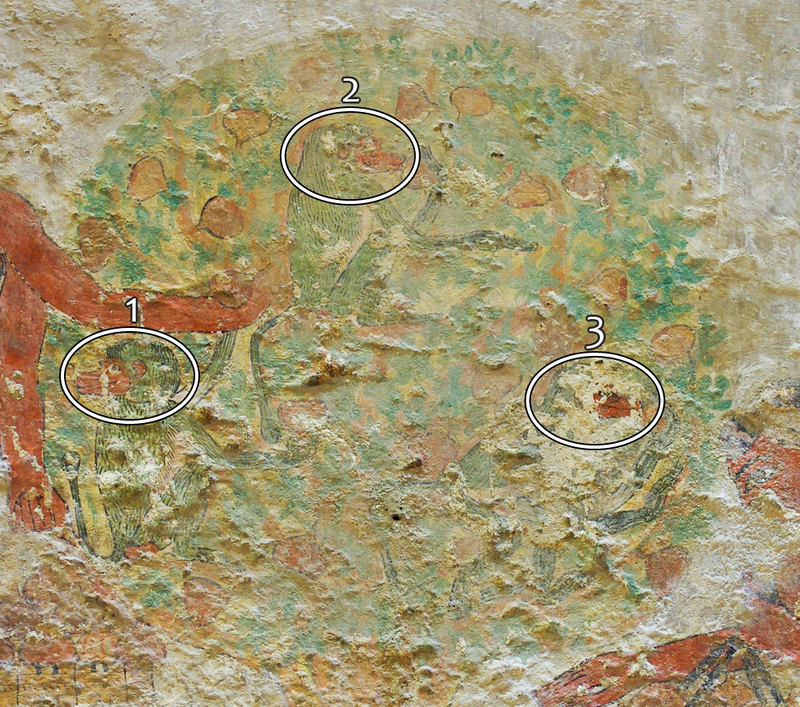 Here is the photo with their faces circled and numbers placed above each monkey's head. Monkey in lower left. He appears to be hanging on the man's arm. Monkey in lower right. This one is the hardest to make out due to damage. Earlier this year, I took my first trip (hopefully of many) to Egypt. 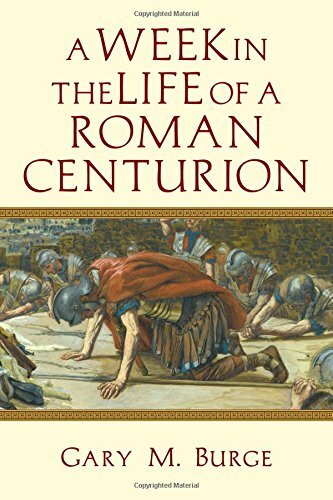 Normally I am interested in Bible history and geography, though recently, my attention has been drawn to ordinary, daily-life objects and cultural behaviors. For Bible times and places, it can be a little challenging to come up with photographs that illustrate these sorts of things. But that is why I found Egypt is so amazing. One of BiblePlaces.com's photographers on location in Egypt. Egypt provides three sources for helping us visualize ancient ways of life. 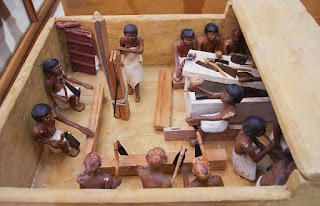 You can probably find examples of tomb models in most museums with Egyptian collections. These are ancient models that depict people in various occupations, most of them I think dating to the Middle Kingdom. Examples include herding cattle, storing grain, baking, butchering, sailing boats. 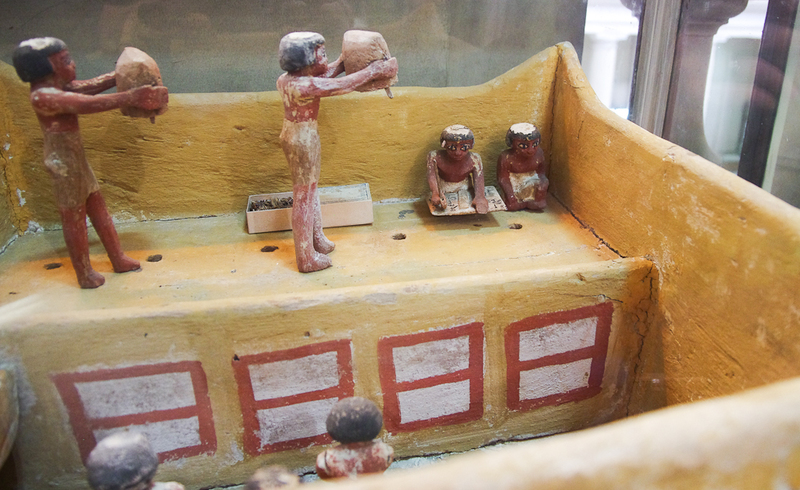 The models were placed in the tombs of nobles and depict the kinds of industries and activities that that particular noble oversaw during his lifetime. 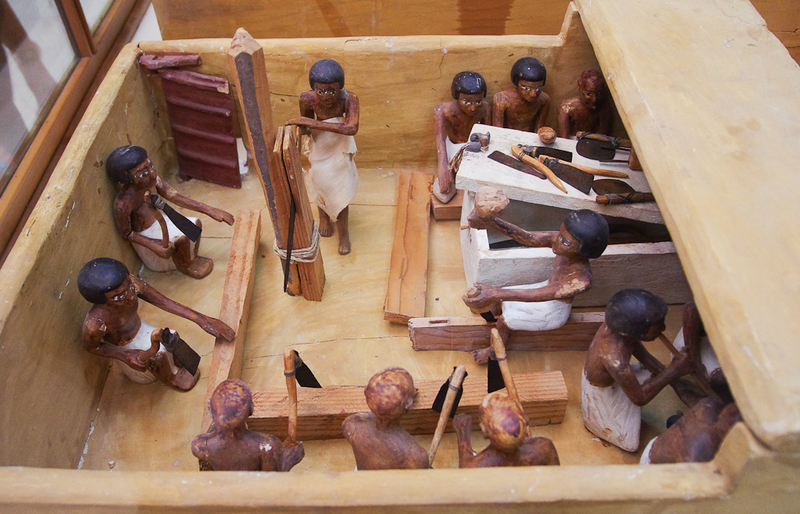 This photograph from the Egyptian Museum in Cairo shows carpenters at work. You can see them with their various tools: mallet, adzes, chisels, saw. Some of them are working on a sarcophagus. In royal tombs, you can see artwork of the king or members of the royal family interacting with deities, involved in funerary rituals, dealing with their enemies, and receiving tribute. In the tombs of nobles, however, the same sources for the models above, you can find elaborate paintings or reliefs of more mundane activities like cultivating fields, hunting, fishing, helping a cow give birth, and so on. Here is a tomb painting from Beni Hasan that shows carpenters at work on a boat. Again, you can see the tools: axes, mallets, and adzes. Above them some carpenters are building furniture. One man is using a saw and another an adze. Between them are several other woodworking tools. 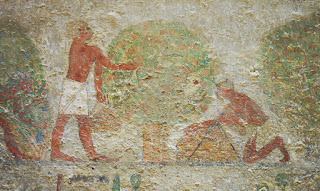 This scene from El-Kab shows the cycle of a grain harvest. 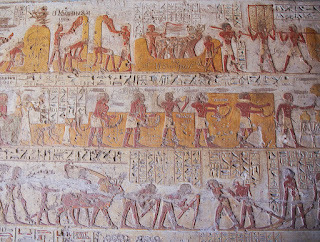 In the bottom register, two plows are being pulled, one by oxen and the other by men. In between two men are tilling with hoes. Partially concealed by the oxen a man is sowing seed. In the middle register, men with sickles are reaping the grain. It must be hot work because the man in the center is stopping to drink from a jug. In the top register, they are bringing the grain in baskets to be threshed by oxen, then winnowed by hand. 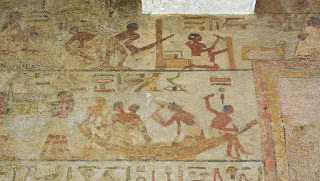 In the top left, a scribe is overseeing the storage of the grain (now shown). And if that were not enough, in Egypt you can see the actual objects themselves, thanks to the arid climate and the fact that burials were located in the desert beyond the cultivated land. 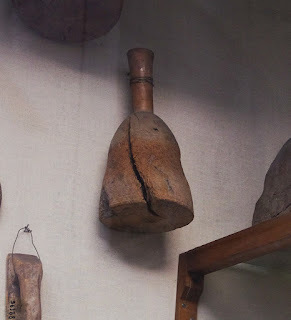 Many items which are not preserved in other countries—such as textiles, food, wood—can be found in Egypt. In keeping with the theme of carpentry, here is a wooden mallet. 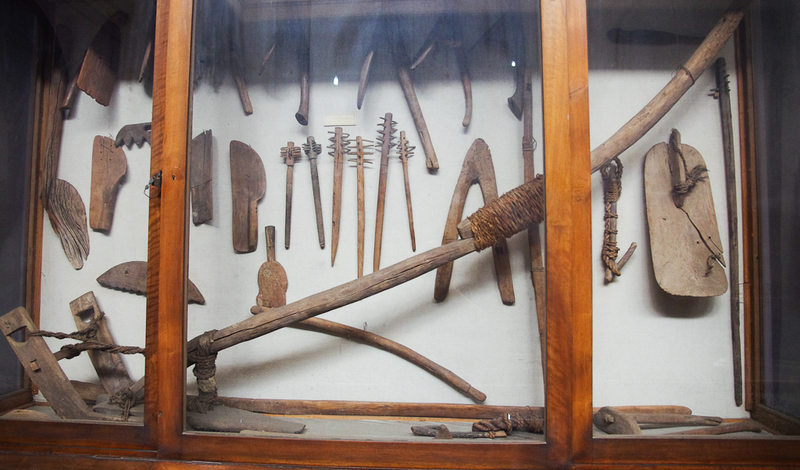 This case in the Egyptian Museum in Cairo shows many of the tools shown above: a wooden plow (with fiber ropes! ), hand scoops for winnowing grain, and hoes. I might also make mention that, although not unique to Egypt, in the rural agricultural villages and fields, you can see traditional methods of farming, herding, butchering, etc. that in many cases do not appear all that different from their ancient counterparts. UPDATE: Follow-up post "Travel in Egypt."